Absolute control over the official community; sufferings of the underground community, manipulation and corruption of the bishops, who risk expressing only a formal allegiance to the Pope. 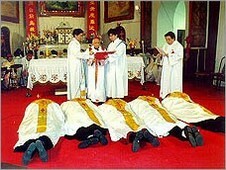 The problems of the Church in China also come from the hesitation of the Catholic side. Growing risk of enslavement of pastors and that the directions of Benedict XVI in his letter to the faithful of the Church in China, will be forgotten. Card. Zen’s report before his fellow cardinals and the pope during the Consistory. Vatican City (AsiaNews) – At most in China, there is freedom of worship, but the government has in no way relaxed its policy of absolute control over religion and the Catholic Church, manipulating ordinations and corrupting bishops, even those legitimized by the pope. This is the sad overview submitted by Card. Joseph Zen to his brother cardinals, on the day of discussion and reflection convoked by the pope on 19 November, before the last consistory. In the text published in full, the retired bishop of Hong Kong emphasizes that there is hesitation even in Vatican policy, which may lead to a wrong interpretation of the directions of Benedict XVI, in his letter to the Catholics of China. NB: The notes are by AsiaNews. If you were to visit China (which I do not recommend, because your visits will be manipulated and exploited for propaganda purposes), you would see beautiful churches full of people who pray and sing, as in any other city in the Christian world. But religious freedom cannot just be reduced to freedom of worship. It is much more. Some will protest this. Some people have written: "Beijing wants the bishops called for by the Pope”. If only it were true! The fact is that there is an ongoing “tug of war "in which I do not know who has conceded most ground. The fact that recently there have been no illicit Episcopal ordinations is certainly a good thing 1]. But when the Chinese government continues to raise its voice and our opportunities to investigate are so limited, plus the fear of increased unrest, there is a real risk that young unworthy bishops will be approved and reign for decades. On the other side there is, however, no intention to change. The Chinese Communists have always stood by the religious policy of absolute control. We all know that the Communists crush those who are weak, while in front of the firm, sometimes they can also change their attitude. There was a papal letter to the Church in China, already more than three years ago, a masterpiece of balance between the clarity of truth and magnanimity for a dialogue. Unfortunately I have to say that [it] was not taken seriously by everyone. There are those who are allowed to express themselves in a different way (see the so-called "explanatory notes" that accompanied the publication of the Letter), there are some who give a distorted interpretation to it (Fr. Jeroom Heyndrickx, CICM), citing expressions out of context. This interpretation says that now everyone from the underground community should come out into the open [= register with the government]. But the pope did not say that. He said, yes, that the clandestine condition is not a normal one, but he also explains that those who feel forced to go underground often do so to avoid having to submit to an illegal structure. The Holy Father said, yes, that individual bishops may consider whether to accept or seek the public recognition of the government and work out in the open, but not without first warning them of the danger that unfortunately the authorities "almost always" (this particle disappeared in Chinese translation prepared by the Congregation for the Evangelization of Peoples) would require conditions unacceptable to a Catholic conscience. This misinterpretation - but one which of course found the consensus (in the Curia) of those who have direct responsibility for the Church in China - has created great confusion and caused painful divisions within the underground community. This misinterpretation has been repudiated only after two years in two notes in the Compendium of the papal letter, edited by the Holy Spirit Study Centre in Hong Kong and approved by the Standing Committee of the Commission for the Church in China. Those notes make clear that the reconciliation recommended by the Holy Father must be a rapprochement of hearts between the two communities, but a unification (such as a "merger" as "transfer") is not yet possible given the unchanged policy of the government. But even after this clarification, the work of some who have their hands on the steering wheel does not seem to have made any change in direction, as is easily seen in the tragic events in Baoding, in the last act of the installation of the poor Mgr. Francis An, a seriously ambiguous act, but on which there has been silence - from August 7 until today - leaving the community of the faithful bewildered, not only the underground, not only in Baoding, but in all of China. The poor underground community is certainly the pars potior [the biggest] of our Church in China and today feels frustrated. While it found many words of encouragement in the Letter of the Holy Father, on the other hand it is treated as annoying, cumbersome, disruptive. It is clear that some would like to see it disappear, absorbed into the official one, that is, under the strict control of the government (so then there will be peace?). But what condition is the "official" community in? We know that almost all of its bishops are legitimate or have been legitimized. But the humiliating and suffocating control of bodies which are not of the Church - Patriotic Association and Religious Affairs Bureau - has not changed at all. When the Holy Father recognizes those bishops without requiring that they immediately peel off from the illegal structure, it is obviously in the hope that they will work from within to get rid of that structure, because this structure is not compatible with the nature of the Church. But after so many years what do we see? A few bishops have lived up to that hope. Many have tried to survive, however, no small number of them, unfortunately, have failed to act in a manner consistent to their state of communion with the Pope. Some have thus described them: "happy to travel along in the carriage of the independent church and content to cry every now and then: Long live the pope! ". The government that once used threats and punishments has now improved its methods of persecution: money (gifts, cars, restructuring of residences) and honors (members of the People's Congress, or political advisory body at different levels, with meetings, lunches, dinners and all that follows). What is “our” strategy? I fear that often it is a false compassion that leaves our weaker brethren to slide down and become increasingly more and more enslaved. The excommunications that are dealt out are "forgotten" on the sly, to the question: "Can we go to celebrate the 50th anniversary of the first illegal ordination?" You reply: "Do everything possible not to go" (and of course they almost all went). After lengthy discussion at the Commission for the Church in China, it was decided to send a clear order to the bishops not to attend the planned so-called "Assembly of Representatives of the Church in China", but there are still those who say, "we understand the difficulties the bishops meet by not going" . Faced with these conflicting messages the government knows it can ignore the Pope's letter with impunity. Dear brothers, I suppose you are aware of recent events: they are again trying to make an Episcopal ordination without pontifical mandate. For this reason they seized bishops, put pressure on others: they are grave offenses to religious freedom and personal dignity. I appreciate the timely, accurate and dignified statement of the Secretary of State. Among other things, there is reason to suspect that such attempts are not even from above, but from those who over the years have gained positions of power and benefits and do not want things to change. Let us pray to Our Lady, Help of Christians, so that the eyes of the supreme leaders of our nation may be opened, so they may stop these evil and shameful moves and strive to allow our people true and full religious freedom, which also be to the benefit and honour of our motherland . We pray that the strategy on "our" part can get back on track, so that it may honestly abide by the direction of the Letter of the Holy Father. Hopefully it is not too late for good change of direction. 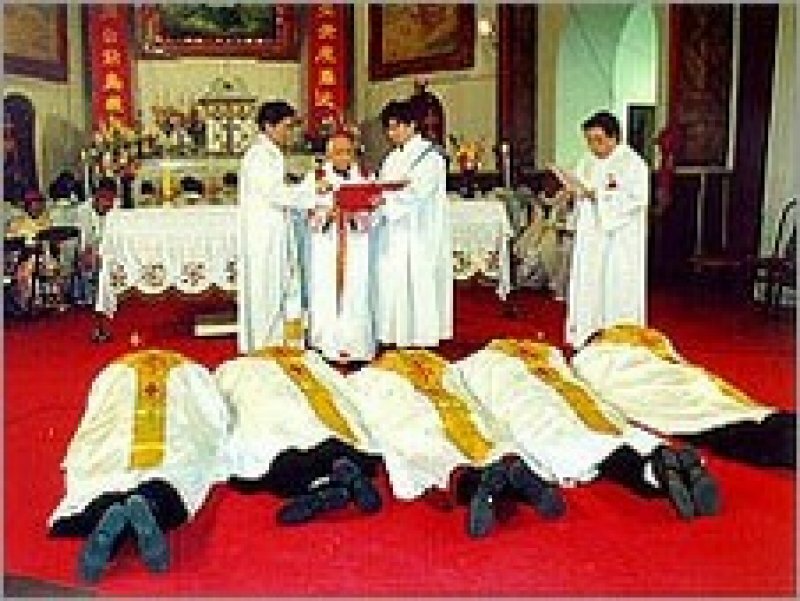 The report was made on November 19 last, when the illicit ordination of Chengde had not yet occurred (see AsiaNews.it, 11/20/2010 Chengde, eight bishops in communion with Pope participate in illicit ordination). 4] See: AsiaNews.it, 29/10/2009 CHINA - VATICAN In Hebei, underground bishop joins Chinese Patriotic Catholic Association and other related articles.